Toad rock lies overhanging the Nakki Lake and is clearly visible even from a distance. So called due to its likeness to gigantic toad about to leap into the water, it is a nice little trek in Mount Abu for those raring for a bit of adventure. 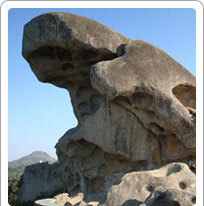 Nun Rock, Nandi Rock and Camel Rock are other attractive rock formations nearby.